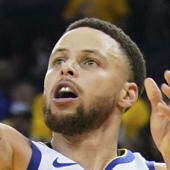 Buoyed by James Harden's return to the lineup, the Houston Rockets picked up an impressive win on Saturday night, beating the Golden State Warriors 116-108. Harden had 22 points, including a dagger step-back 3 over Curry to seal the win, while Chris Paul dropped 33 points. Those performances were not unexpected. Stepping up in a big way to help get the Rockets a key win was Clint Capela, who finished with 18 points, five rebounds and four steals. The Rockets are a very good team, and last night they were better than the Warriors. They've even won two out of the three meetings between these teams this season. Of course, Capela and the rest of the Rockets should think they're better than the Dubs. If you don't believe you can beat a team, you're probably not going to beat them. However, there was really no need for him to publicly make a statement like that. Now, Capela and the Rockets will have that quote hanging over their heads for the rest of the season -- and even more so if they meet the Warriors in the playoffs. That was probably a sentiment that he would have been better off just keeping in the locker room.